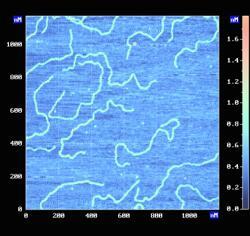 Typical AFM image of the DNA test sample (obtained in noncontact mode, humidity is 1-10%, Solver P47BIO, NT-MDT-SI.). DNA01 is Plasmid pGem7zf+ (Promega) which is linearized with the SmaI endonuclease. A linear DNA molecules (3000 b. p.) are deposited onto freshly cleaved mica. Molecules are uniformly distributed on the surface with molecule density - 0,5-7 molec./um2 and typical DNA length 1009 nm. Recommended humidity for obtaining a good image is 3-5%. - test samples for Z-resolution of commercial SPMs.